Ask fellow campers about "Adventure Bound Camping Resorts – Cape May" and nearby attractions. My family and I have been camping for over 18 years. 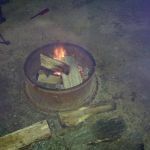 We have been to over 10 or more different campgrounds around PA and NJ. I have two major complaints about this place. One is that the bathrooms were very dirty at all different times of the day, the floors were always wet and muddy and trash was all over the place. Second is that the manager walks around at 11:05 p.m. and tells everyone to turn OFF their radios. I have never experienced this at any other campground I have been to. I always thought that "quiet hours" were meant to be considerate and courteous towards other campers. Here, it seems that quiet hours mean time to go to bed. My wife and I were listening to music on our cell phone at a very low volume and the owner insisted that we turn it off altogether. One more thing to mention and think about before camping here is that the campground consisted of almost 80%-90% Mexican/Brazilian campers. There is a large tenting section in the back of the campground which the sites were right on top of each other. It was like "Tent City". To sum it up, the biggest negative of this campground is the manager walking around at 11:00 p.m. and telling people that it was basically time to go to bed. 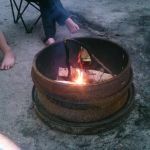 • • • We camped at Adventure Bound Camping Resorts – Cape May in a Cabin. This is one of the worst campgrounds that we have stayed at. The bathrooms were filthy. The sites are small. Very few full hook up sites and only a few water & electric with 30/50 amp. This campground is more for tent's or pop ups. You only could get Wi-Fi in the office or by the pool.This campground is loud and noisy. The store was fairly well stocked with almost everything you would need. That's the only good thing about this park. I definitely would not stay here again. 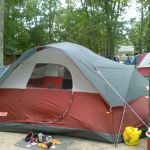 We camped at Adventure Bound Camping Resorts – Cape May in a Motorhome. Even though the staff was very friendly and accommodating, the campground was terrible. It was noisy all day and night, there is little privacy between campsites, and the children's playground is in need of repair. It was like camping in a parking lot with a few trees spread throughout. We could see every neighbor on every side with no seclusion. At night they had karaoke in the activity center, which was extremely loud and could be heard throughout the entire campground. There was no escape. On our way out of the campground we were held up in a line of traffic as some campers got into a fight with the gate attendant. Needless to say, we wouldn't return to the campground. We camped at Adventure Bound Camping Resorts – Cape May in a Travel Trailer. This campground is almost evenly divided between seasonal and tent camping,with limited sites for transient full hookup travel trailers. Beware, the available sites are very narrow! 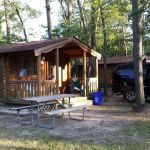 This campground does have excellent location due to it's proximity to the Garden State Parkway.You can be at almost any location in the Jersey shore area within 15 minutes. Thats why this place is packed. The staff was competent, the pool was clean and there were some activities for kids.The camp store was very well equipped. All our activities were outside campground. We did not need to use other facilities, so no comment there. Overall, it was an average campground with good location. I need a little more room than what they provide for the transient travel trailer, so I do not plan to return. We camped at Adventure Bound Camping Resorts – Cape May in a Travel Trailer. The toilet and shower facilities were obsolete and extremely dirty. Faucet and shower water in the bathrooms had an extreme metal odor. Pay showers were the only type available. The showers contained dirt, sand, and mold. There was a staff to clean the facilities, we know this because male worker walked into the women's facility while my wife was showering. After complaining, management advised that they were busy preparing for the seasonal residents to arrive, and that a new bath house would be in service in a couple of weeks. There were hundreds of cigarette butts in the sites, and none of the brochure's promised children's activities ever took place. There are too many other campgrounds near the Wildwoods, I would absolutely not recommend this one. We camped at Adventure Bound Camping Resorts – Cape May in a Travel Trailer. Overall a nice quiet place to stay. Unfortunately for us, during the time we was there, the sewer of the showers/restroom was defective. The staff did a minor fix but it was really not enough. The restroom wasn't very clean too. The problem wasn't an overflow but a very bad smell. Everything else was very good. Activities are: pool, playground for kids and tennis court. We camped at Adventure Bound Camping Resorts – Cape May in a Tent Trailer. Are you affiliated with Adventure Bound Camping Resorts – Cape May ?